It’s important to dispose of expired fire extinguishers immediately once they are no longer usable. Do you have old fire extinguishers lurking around your home or business? It’s important to dispose of expired fire extinguishers immediately once they are no longer usable. An expired fire extinguisher could be mistaken for a new one and improperly used in the event of an emergency. 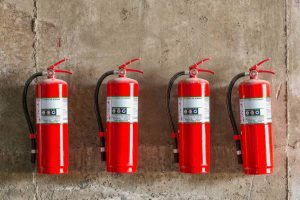 More importantly, you could face a penalty during your annual fire inspection for having expired fire extinguishers displayed in your business. That being said, what are you supposed to do with an expired fire extinguisher once it’s used up? How Can You Tell a Fire Extinguisher is Expired? Disposable fire extinguishers need to be replaced every 12 years, even if they are not technically expired. Disposable fire extinguishers are those that are typically smaller in size and have a gauge on top that reads full/empty. Over time, disposable fire extinguishers lose air pressure and need to be replaced. Rechargeable fire extinguishers last for even longer, providing that you don’t skip your yearly or monthly inspections. Professional servicing will keep rechargeable extinguishers in good condition and ready to use. Even if your fire extinguisher is not technically expired, it will not be ready to use or operate during an emergency and could actually harm anyone trying to use it. How Do I Dispose of an Expired Fire Extinguisher? If the fire extinguisher is completely full or partially full, release the remaining pressure inside of the canister by slowly squeezing the top. This should have a little bit of the actual contents come out of the canister. Once you press down, watch the needle on the gauge to see when it hits zero. That might take a few days to occur. Once it is at 0, you can take the expired fire extinguisher to a hazardous waste facility. The workers there will be able to recycle both the canister and the agent inside of the fire extinguisher. Some local fire departments also accept expired fire extinguishers. If your expired fire extinguisher can was already empty, you can briefly press on the handle to ensure that the gauge remains at 0. Next, you can dispose of it using the steps noted above. This entry was posted on Friday, September 1st, 2017 at 1:05 pm. Both comments and pings are currently closed.